How Does it Compare to Bovine? How Does PhosphatidylSerine (PS) compare to PhosphatidylCholine (PC)? 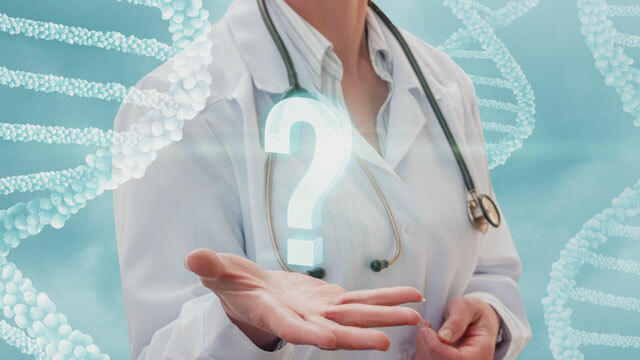 What Can PhosphatidylSerine Do for Me? PhosphatidylSerine (PS) in Flavay Plus® is clinically proven to be safe and effective for improving memory deficit disorders and other higher brain functions. 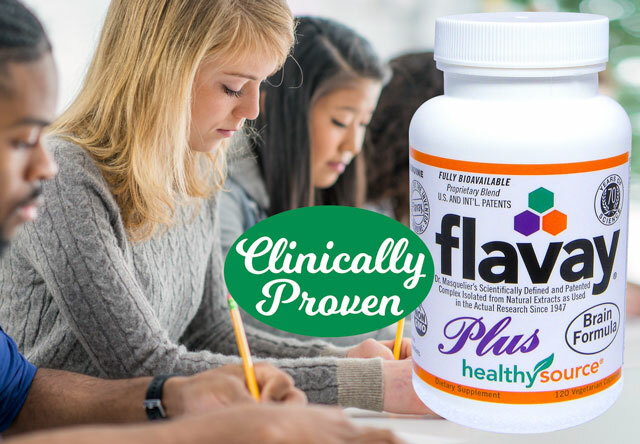 The original, clinically-proven PS in Flavay Plus® increases metabolism throughout the brain. Why Do I Need PS? Because of stress, aging, modern eating habits and food-production methods. Your body cannot produce phosphatidylserine in sufficient amounts when under stress, when aged, or when lacking in the necessary enzymes and metabolic cofactors. 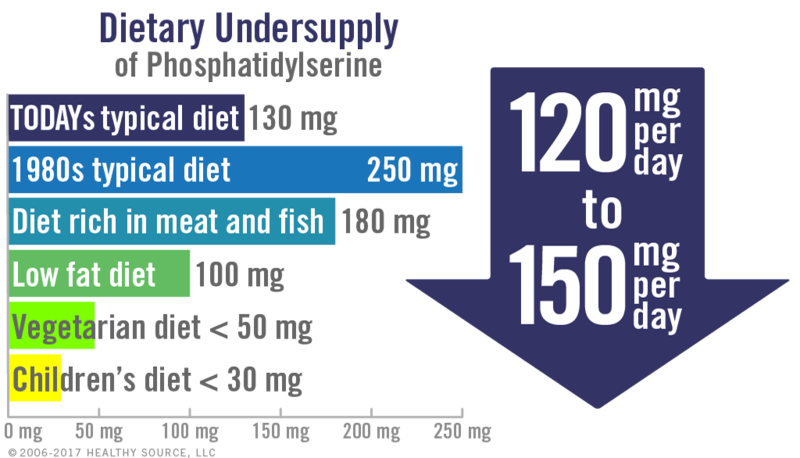 The average daily intake of phosphatidylserine in Western diets is well below healthy levels. 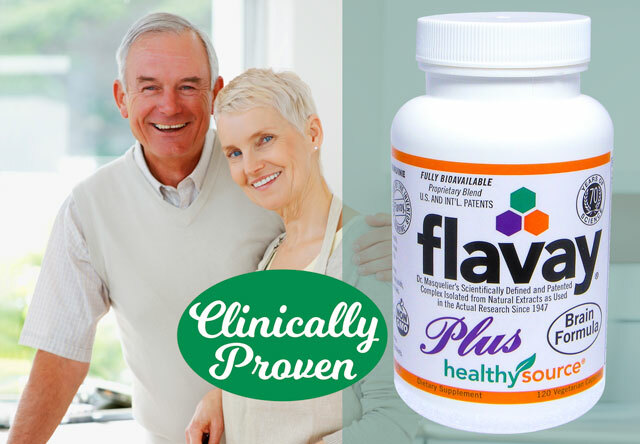 My psychologist husband told me that the difference in my behavior and focus is huge since taking Flavay and Flavay Plus. I am definitely ADD but was never diagnosed as a child. He is amazed at the changes in me, as am I. In 2006 I stopped taking Zoloft because it made me sick. That's when I found Flavay and Flavay Plus and I've been taking it ever since (12 years) and it gets me going every day. Such a difference in my life. It's been very good for me. My wife takes it too. Studies found taking phosphatidylserine (PS) increases choline levels in brain cells where taking phosphatidylcholine (PC) had no effect. improve learning concentration and word skills. modulate many aspects of cortisol overproduction, especially following intense exercise. After one month of taking Flavay and Flavay Plus, I feel really good. I feel younger, like I used to feel 5 years ago, so that I want to start a business, and other things like that. My wife says I even look different. I'm 26 and have a severe case of ADHD, and just recently started taking Flavay Plus. From the first week I was taking three to four pills per day, and feeling the results quite rapidly... I'm thrilled with the results I'm getting with Flavay Plus. Flavay Plus really helps me sleep, I love it. In taking Flavay and Flavay Plus I really notice in my concentration. It seems to help with that. I can tell a difference. Also, I feel like I look younger when I'm taking Flavay, in my skin and hair, it looks better. I've noticed a big difference in my sleep, I sleep better and I have more energy. Flavay is a wonderful product! Both physical and mental stressful conditions cause stress hormones to be released into circulation, even in the young and healthy. 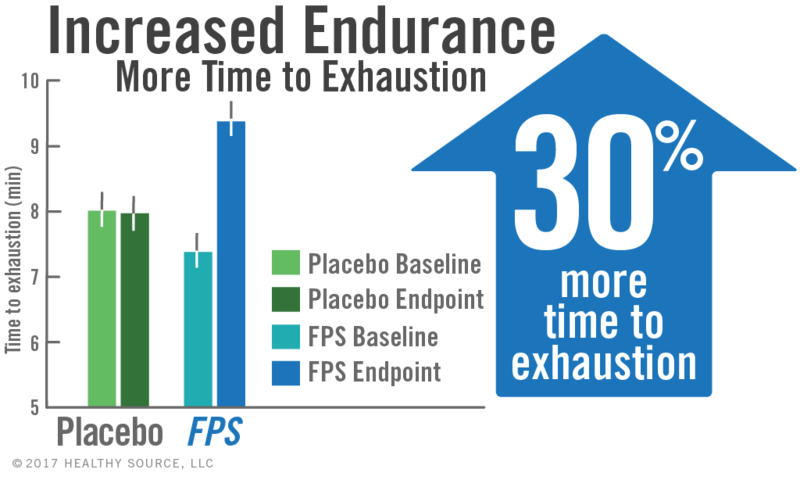 In athletes, prior to starting exercise, taking PS in Flavay Plus® produced an impressive degree of down-regulation of the stress hormones. Researchers found PS has the capacity to "normalize" the stress-induced activation of the hypothalamic-pituitary-adrenal axis. I want to thank you for Flavay Plus, it's just wonderful. My anxiety, panic and stress levels plummeted and my skin became clear and radiant. I've been taking 4 Flavay per day for about a month and the thing I really did notice is my stress level is really good. I've had a lot of unusual stress and with the Flavay I'm handling the stress a whole lot better. Human clinical studies show phosphatidylserine may assist against the symptoms of dementia and Age-Associated Memory Impairment (AAMI), also in reducing the risk of dementia and cognitive dysfunction. Phosphatidylserine is a phospholipid (a fatty molecule) which contains both amino and fatty acids. Phosphatidylserine is a fatty molecule and includes amino and fatty acids such as docosahexaenoic acid (DHA). Phosphatidylserine is found in every human cell and is universally present in living things from the most simple to the most complex. Phosphatidylserine has many known functions throughout all our tissues and organs, and most importantly, our brain. This natural supplement has proven effective for ADD and ADHD. *Newer (and unproven) sources of phosphatidylserine are now in the marketplace, see: Has sunflower-derived phosphatidylserine proven effective for cognitive improvement? A phosphorylated serine is available as a dietary supplement but does not substitute for phosphatidyl serine (PS), despite the claims of its manufacturer. Though it resembles the head piece, phosphorylated serine is different—it is not a phospholipid and does not work like PS does. Consumers report phosphorylated serine can cause highly uncomfortable adverse reactions. Be sure you get the real thing. Phosphatidylerine’s tails of amino and fatty acids, the extra negative charge on its head piece and unique conformation are essential to its specific actions. 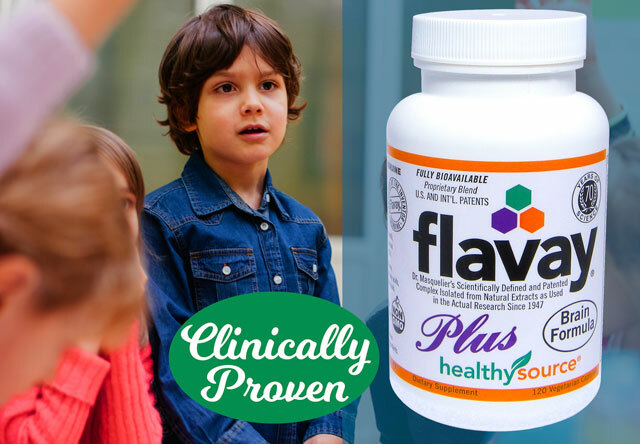 Phosphatidylserine in Flavay Plus® is extracted from soy fractions which is highly purified and *Certified Soy-Free* and confirmed non-GMO. The phosphatidylserine in Flavay Plus® was the subject of many human clinical trials regarding memory loss, mood, cognitive performance and learning ability. 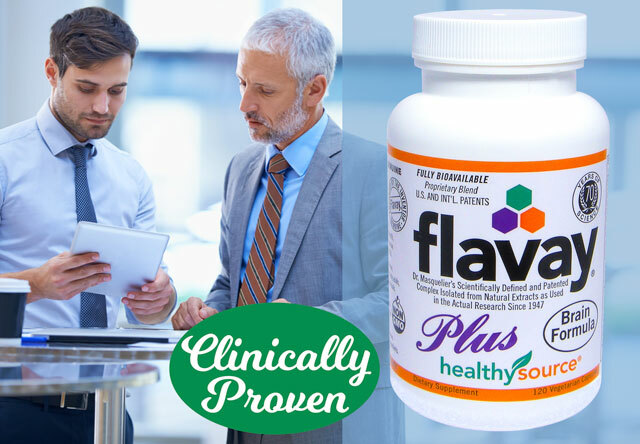 The use of phosphatidylserine in Flavay Plus® is well validated through clinical research and proven safe in standard toxicology tests. The large number of human studies conducted on phosphatidylserine in Flavay Plus® produced a flawless safety record. First, it has proven compatible with a wide array of medications including: antacids, anti-hypertensives, anti-inflammatories, anti-ulcer and mucolytic agents, diuretics, anti-thrombotics, hypoglycemics, anti-arrhythmics, insulin, calcium channel blockers, calcitonin, chemotherapy drugs and other prescription medications. Second, phosphatidylserine is well tolerated by elderly patients with chronic diseases such as cerebrovascular, artery and vein disorders, heart diseases, high blood pressure, diabetes, lung diseases, digestive system diseases and arthritis. Not all phosphatidylserine products are equal. The marketplace is full of inferior variations of scientifically-proven products. Those who are looking for proven results—and not just claimed or implied results—want the authentic products used in scientific research. Has sunflower-derived phosphatidylserine proven effective for cognitive improvement? Consumers want phosphatidylserine that's proven safe and effective. 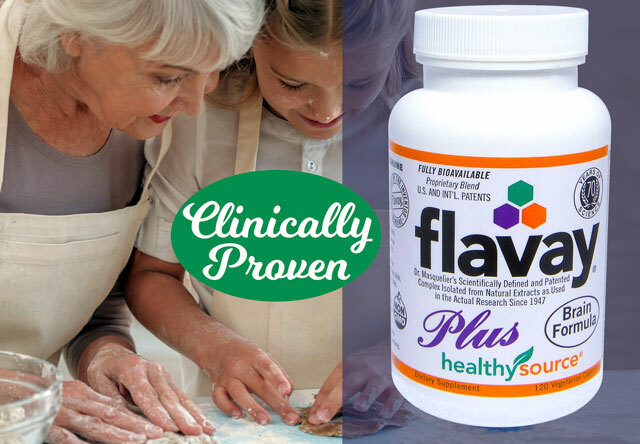 Phosphatidylserine in Flavay Plus® is patented and validated by clinical trials. Change the way you grow older by protecting your memory for the many years ahead. 106. Kidd, P.M. A review of nutrients and botanicals in the integrative management of cognitive dysfunction. Altern Med Rev 1999 Jun;4(3):144-61. 109. Klinkhammer P., Szelies B., Heiss W.D. Effect of phosphatidylserine on cerebral glucose metabolism in Alzheimer's disease. Dementia. 1990;1(4):197-201. 110. Kidd, P.M. Phosphatidylserine: the nutrient that accelerates all brain functions and counters Alzheimer’s disease: Keats Pub. 1998. 114. Cenacchi T., et al. Cognitive decline in the elderly: A double-blind, placebo-controlled multicenter study on efficacy of phosphatidylserine administration. Aging, 5: 123–133, 1993. 115. Maggioni M., Picotti GB, Bondiolotti GP et al. Effects of phosphatidylserine therapy in geriatric patients with depressive disorders. Acta Psychiatr Scand. 81: 265–270, 1990. 116. Brambilla, F., Maggioni, M., Panerai, A.E., et al. Beta-endorphin concentration in peripheral blood mononuclear cells of elderly depressed patients—effects of phosphatidylserine therapy. Neuropsychobiology, 34: 18–21, 1996. 117. Monteleone P., Maj M., Beinat L., Natale M., Kemali, D. Blunting by chronic phosphatidylserine administration of the stress-induced activation of the hypothalamo-pituitary-adrenal axis in healthy men. Eur J Clin Pharm, 43: 385–388, 1992. 119. Funfgeld, E.W., Baggen, M., Nedwidek, P., Richstein, B., Mistlberger, G. Double-blind study with phosphatidylserine (PS) in parkinsonian patients with senile dementia of Alzheimer’s type (SDAT). Prog Clin Biol Res, 317:1235-46, 1989. 121. Fahey TD, Pearl MS: The Hormonal and Perceptive Effects of Phosphatidylserine Administration During Two Weeks of Weight Training-Induced Over-Training. Biol Sport 1998, 15(2):135-144. 126. Crook, T.H. Treatment of Age-Related Cognitive Decline: Effects of Phosphatidylserine in Anti-Aging 33 Medical Therapeutics,Vol II, edited by R.M. Klatz, Health Quest Publications, Chicago, 1998, 20-29. 127. Vannucchi, M.G., Pepeu, G. Effect of Phosphatidylserine on Acetylcholine Release and Content in Cortical Slices From Aging Rats.Neurobiol Aging 1987, 8(5), 403-407. 133. Mazzari, S., Battistella, A. Phosphatidylserine effects on dopamine release from striatum synaptosomes. In: Multidisciplinary Approach to Brain Development. Benedetta, C., Balazs, R., Gombos, G., Porcellani, G. (Eds.). Elsevier/North Holland, Amsterdam, 1980, 569-570. 137. Kaibuchi, K., Takay, Y., Nishizuka, Y. Cooperative roles of various membrane phospholipids in the activation of calcium-activated, phospholipid-dependent protein kinase. J. Biol. Chem. 1981, 256, 7146-7149. 144. Burke, E.R., Fahey, T.D. Phosphatidylserine (PS): Promise for Athletic Performance. Keats Pub. 1998,New Canaan, Connecticut, USA, ISBN: 0-87983-979-1. 145. Burke, E.R. PS: An Answer To Intense Training.Nutrition Science News 1998, 3, 252-253. 299. Cohen, SA, et al. Age-related alterations of NMDA-receptor properties in the mouse forebrain: partial restoration by chronic phosphatidylserine treatment. Brain Research 1992, 584, 174-180. 331. Blum K, Chen AL, Braverman ER, et al. Attention-deficit-hyperactivity disorder and reward deficiency syndrome. Neuropsychiatr Dis Treat. 2008 Oct;4(5):893-918. 332. Kapur S, Mann JJ. Role of the dopaminergic system in depression. Biol Psychiatry. 1992 Jul 1;32(1):1-17.